A number of my favorite records made me laugh the first time I heard them. Melt-Banana‘s Scratch or Stitch LP was so ridiculously jolting and squeaky that I grinned ear to ear in bemused amazement. Emperor‘s Anthems to the Welkin at Dusk is so preposterously melodramatic and fast that I still can’t take it seriously. And who can listen to Xerobot‘s dazzlingly robotic Control Panel CD with Greg Peter’s spastic vocals without busting a chuckle? All classic, all amazing, and all noteworthy for an x-factor quality that really made them stand out from the pack. 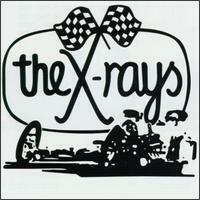 In this great pantheon of underground benchmark albums lies The X-Rays’ Speed Kills CD. While they were part of the mostly unremarkable Gearhead zine garage punk scene of the mid-1990s, they upped the ante with an outrageously loud, fast, and over-the-top take on the whole leather jacket punk rawk thing. I can still distinctly recall hearing the first few seconds of “Racin’ Outta Napolis” for the first time, shaking my head and laughing at the audacity and overdrive of this Nottingham psycho squad. It begins like a number of lesser gearhead punk albums, complete with revving engines throttling to take off, but after a quick count it lurches into crazy territory and races into one of the more noteworthy garage punk records of the genre. Their Empty follow up Double Godzilla with Cheese continued the wacky hi-jinx with the entire album playing backwards after the last track.